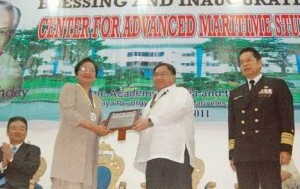 In response to the growing need of its principals for senior officers to fill high level positions ashore and provide career advancement for management level officers working aboard ships, the Maritime Academy of Asia and the Pacific (MAAP) has established the Center for Advanced Maritime Studies (CAMS). AMOSUP President Dr. Conrado S. Oca awards a plaque of recognition to Hon. Sec. Rosalinda Baldoz of the Dept. of Labor and Employment as guest of the blessing and inauguration of the Center for Advanced Maritime Studies in the Maritime Academy of Asia and the Pacific (MAAP) campus in Mariveles, Bataan. Looking on were (far left) Capt. Yoji Fujisawa, President of the All-Japan Seamen’s Union (JSU) and (far right) Vice Admiral Eduardo Ma. R. Santos, AFP (Ret. ), President of MAAP. With its creation, CAMS addresses the demand in the industry for qualified and well-trained marine office executives and maritime educators, offering programs aimed at raising the academic status of Filipino merchant marine officers and preparing them to be effective Ship Superintendents or Maritime Professors. CAMS is the embodiment of the vision of the late Captain Gregorio S. Oca, founding Chairman of MAAP and past President of AMOSUP, to improve the lives of the Filipino seafarers by expanding its welfare services through education and training. The Center also reflects the commitment of Vice Admiral Eduardo Ma. R. Santos, AFP (Ret.) to offer educational programs in order to raise the academic status of Filipino Merchant Marine Officers and prepare them for reintegration to society as Ship Superintendents or Professors ashore.